This tutorial is outdated, not guaranteed to work. NVIDIA Optimus, the switchable graphics adaptation for laptops/notebooks by NVIDIA, still doesn't fit well with Linux. That's why most Linux users having a laptop with optimus GPU faces problems like hot GPU(around 65° C), decreased battery life, roaring cooler fan etc. etc. So if you are one of those lucky person with a optimus laptop and want to use your discrete GPU rather than turn off it totally, this tutorial is for you. This guide is specially for Debian and other directly Debian based distro like Kali Linux, LMDE etc. Here we are going to do this with bumblebee, bbswitch, and non-free debian nvidia optimus drivers. For newbies, if you don't know what are these things, you may have a look at the bumblebee project . Bbswitch is the kernel module used to turn off and on the discrete nvidia GPU and non-free nvidia optimus linux drivers are the proprietary GPU drivers provided by nvidia. Advantage of bumblebee over other solutions like nvidia prime is you can run one/many specific application using the discrete nvidia GPU without restarting the current X-session on the fly. First step is to know the system thoroughly, first check nvidia card. Currently Debian loads them automatically if any discrete GPU is found. If your kernel is loaded with the nouveau and other related modules, its the time to unload them with the modprobe command. Change the word stretch according to your disto, like if you are using the Debian stable jessie, replace it with jessie . If you are not sure what I'm talking about, have a look at there and check out the sources.list portion. This will take some time to download and install the packages and compile kernel modules. when the installation is complete, load the bbswitch module. Testing: Now test the if the bbswitch is working properly or not. This should return a line with the word OFF along with the PCI bus id the nvidia GPU, the PCI bus id could vary machine by machine. Another way to check it run the command lspci -v | grep -i 'vga' | grep -i 'nvidia' (mentioned above, watch out the fancy quotes) and check the end of the result line, if the prog-if value is ff then the GPU is off, if the value is 00 then the GPU is on. To avoid auto load of nouveau and related modules after every reboot, they should be blacklisted. Just create a file with your favorite text editor named nouveau-blacklist.conf under the /etc/modprobe.d/ folder and put this line blacklist nouveau inside it. It could also be done with a single line command. Just enter the root password and you are done. The bbswitch module is loaded automatically at every power up and turns off the discrete nvidia optimus GPU, no need to load it manually. Now we have to install the non-free nvidia drivers, bumblebee and some related extra packages. Wait some time to let the installation process finish. VirtualGL is required for the the optirun command as a bridge, but unfortunately Debian repository do not have the VirtualGL package, so we have to download it. Go to VirtualGL sourceforge repository and download the suitable package for your system. i.e. if you are using Debian 64 bit, download the latest amd64 package. Now install it with dpkg. Also don't forget to change the path according to where you download the file. Fortunately bumblebee works fine with it's default configuration. But if you want to make any change to the settings, edit the /etc/bumblebee/bumblebee.conf file as root with your favorite text editor and restart the bumblebee service with this command sudo service bumblebeed restart . Accessing the discrete nvidia GPU needs root privilege, so have to add your system's username to the bumblebee group. Now restart the bumblebee daemon with sudo service bumblebeed restart . Now you are done, reboot the system. Optional: You may need to add some extra configuration to the xorg.conf.nvidia file to avoid mouse module related error. Open the /etc/bumblebee/xorg.conf.nvidia file with your favorite text editor as root , then add the extra configuration there. Save the file and exit the text editor, and restart bumblebee daemon. 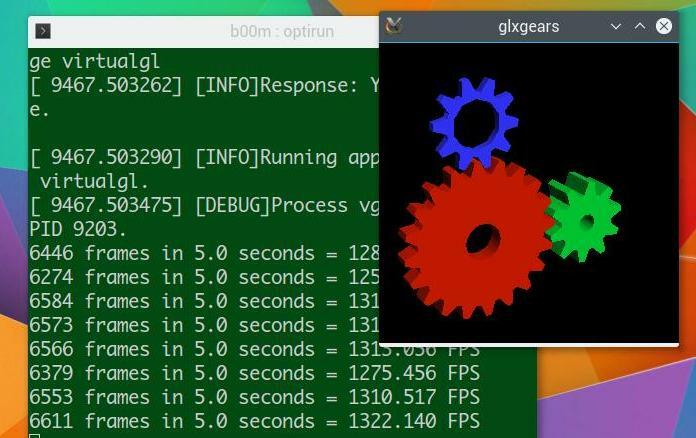 After rebooting the system, you're ready to test the sample glxgears program. There should be some delay (around 3-4 sec.) before starting glxgears, if it returns around or over 1000 FPS performance, that means NVIDIA optimus is working properly. This step is almost identical to check nvidia driver on ubuntu. I didn't faced any problem during installation and testing with Debian stretch, kernel 4.1.0-amd64, nvidia-340.67 driver. Just don't forget to add the apt non-free repository, install VirtualGL and add your user name to the bumblebee group. Sometimes you might need to add some different GRUB parameters to block the automatic loading of nouveau driver. More on the link below. UPDATE: As some readers are facing problems with debian nvidia optimus , I'hv written another tutorial specially for troubleshooting, based on reader feedback. I hope this will be helpful, here is the tutorial > NVIDIA Optimus troubleshooting in Debain . So, that's it, how to setup nvidia optimus debian, this tutorial also useful for any Debian derivative like Kali Linux, or SolydXK. Use your nvidia GPU for something useful, like GPU computing with CUDA, NVIDIA OpenCL, fast password cracking with pyrit and many other computing extensive applications. If you faced any problem during the installation, just leave a comment, and don't forget to share it with your friends.